New! Textfree without WiFi–even on iPod touch! For several years now, a secret research group here at Pinger has been working to solve a very challenging problem in the area of autonomous cognitive wave displacement. Last month this group achieved a significant breakthrough: the ability to text, call and even send picture messages without an Internet connection. Don’t worry if all this technical mumbo-jumbo is hard to understand. We often don’t understand Dr. Cloutier either. What we do know is that this significant research finding will affect millions of Textfree users, who can finally say “goodbye” to WiFi. All you need is an iPod touch, Textfree, and an antenna. You can make your own using about $3 in tin foil. Now Textfree with Voice gives you absolute freedom to talk, text, even send picture messages from anywhere on the planet! Who have you talked to without WiFi lately? Get Textfree with Voice FREE in the App Store and start talkin’! Omg i grabbed my ipod right away and looked for this. That was soooo not even funyy, Omg im really mad now thanks a lot. will this actually work? do i make the tin foil like a hat? like how that lady has it in the picture? what a minute APRIL FOOLS RIGHT?! lame. but i’ll take this opportunity to say that I wish textfree would take the time to permanently fix all of the (reoccurring) bugs they keep experiencing instead of constant (albeit, impressive-like free phone calls) innovation. Make the product better before you branch out. Pinger, I love your products. I think your support staff is great. But most users of your products, especially TextFree, are children with a huge sense of entitlement but a tiny funny bone. They are not going to get, or not going to appreciate your April Fools Day humor on this topic. There really are a lot of kiddies out there who think that the only reason they can’t use TextFree on their iPod Touch devices when they’re not connected to the Internet is because you – Pinger – won’t “let” them. hahaha best april fools joke ever. how do you make an account on here?? Heya, Brandon, you simply need an ipod touch or iphone and then install the textfree app on that device and after that you’ll figure it out. You’ll get a phone number that works with your ipod touch so that you can use it as a phone or if is a phone already it spares you of the need for a headset with mic for the ipod touch. Otherwise you’ll just have to limit yourself to sending free SMS texts, not free calls too. If you have a touch, are u still limited to hotspots? or do you get wifi everywhere because of some apple deal or something? Lol, good April Fools joke! Thank you for my laugh of the day. When my thirteen year old daughter can to me asking for $3 in tin foil, to make a hat on her head, it was so enjoyabe. Thank you. Noah’s comment directly above bears out the point I made in my earlier reply to this April Fools Day blog. And also demonstrates that, while today’s kiddies are functional literates with technology, they have no idea AT ALL how their magic boxes work. wow can you text without wifi too! 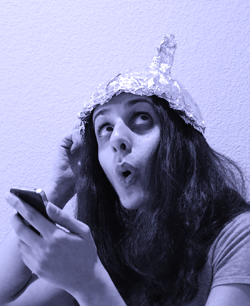 Can you not wear a tin foil hat cause i think wearing one would be kinda weird when your in a car or something. OK this better not be an April fools joke! on april the 1st tha? Angel, I’m sincerely pleased that you know enough about iOS devices to realize that without some connection to the Internet, the TextFree app can’t communicate with the servers. I’m sure there are other young folk like you. However, if you read through the TextFree reviews on the App Store, or follow some online discussions, you will see that my earlier contention is valid. Many, MANY users – the majority of whom are children – do not understand that an iPod Touch simply does not have the “phone guts” i.e. a cell antenna and other internal circuitry to connect to the Internet without wifi. Lmao, to funny! I didn’t fall for it. Anyone who has an iPod, should know that it can’t connect through celltowers, and/or an antenna. Start reading your specs with your devices, peeps, friendly suggestion. My name is Zennia Riley Wallis and I would like to notify you that this new feature on your application does not function correctly on my device(iPod Touch 4g). I followed the directions listed here, and the TextFree application still needed the Wi-Fi connection. May I suggest that you improve the quality of this newly developed feature or I will discontinue my use with your products. Thank you for proving my contention correct. Now go talk to your doctor because you need an immediate infusion of laughing gas and possibly a funny bone transplant. You are welcome for proving your contention correct. It was my pleasure. And Ms J, I apologize for not ‘floating your boat’ but I do wish to get my point across to the Pinger/TextFree company. That wasn’t funny. .-. I really need to text without wifi Dx ARGH! Don’t hold your breath while you wait, because it’s not possible. It isn’t that it’s difficult; it isn’t that Pinger won’t “let” you; it is NOT POSSIBLE. HELLO TEXT FREE A HAVE THE IPOD TOUCH AND I CANT SEND TEXT WITHOUT WI-FI CONNECTION !! yup! yup! yup! yup! yup! I am very confused because at the app store it still says you need wi-fi so will it work or not? 1) I’m not going to where an antenna just so I can see if this works. 2) Even a monkey would know this. 3) I DOESN’T WORK! Haha I luv monkeys !! How Can i Send Txt Messaqes With Pictures? Wait, I cannot fathom it being so strahigtofwrard.